Description Saad Company (Private) Limited has been working in the local market for the past 20 years manufacturing woolen, polyester yarn and blankets. 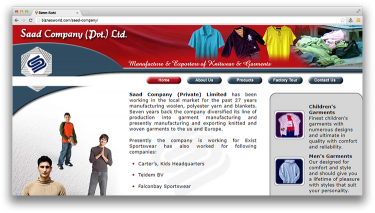 Seven years back the company diversified its line of production into garment manufacturing and presently manufacturing and exporting knitted and woven garments to the us and Europe. Address LA-6/A-1, Block 22 Federal ‘B’ Industrial Area Karachi.